The schools in poorer communities mirror the legacy of the Apartheid education system, in spite of government’s commitment to equitable education. Nearly half of all schools, most in poor communities, have extremely poor infrastructure: 79% have no libraries, 60% have no laboratories and 68% have no computers. The problems of access to education in poor communities are compounded by malnutrition and the impact of HIV/AIDS. A study in 2003 showed that 7% of children were “often or always hungry” and that 17% were “sometimes hungry”. 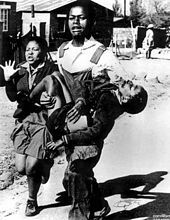 As South Africans take a day to remember 16 June 1976, we urge you to pray with us, from wherever you find yourself in the world, for the futures not only of South African children, but children throughout sub-Saharan Africa. Hands at Work is committed to caring for 100,000 children in sub-Saharan Africa. We say a child is not cared for unless (s)he has received three basic services: food security, basic education and health services. Let's fight for our children!